Good mood, artistic vibes and a lot of talent were the highlights of ITS’s 5th edition since Swatch joined the ride. More than 700 people attended the event where fashion and art join people from all over the world to promote and support young emerging talents. With a seaside view in Trieste, Italy, and the right jury, ITS and Swatch gather the best conditions to award two special talents with the Swatch and ITS TIME FOR COFFEE Awards. It was a night full of emotion and surprises that you surely don’t want to miss in 2019! 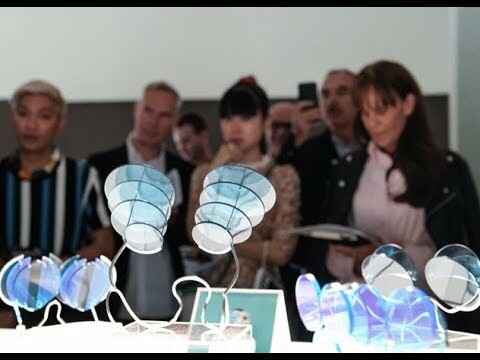 The eight best of the best were under the spotlight to create and engage the jury with their works of art. In the end, it was Sini-Pilvi Kiilunen and Tolu Coker that got the crown. Sini-Pilvi Kiilunen won the Swatch Award 2018, with a cash prize and a six-month paid internship at the Swatch Lab in Zurich and Tolu Coker sipped the new ITS TIME FOR COFFEE award, with a chance to fly to Shanghai and stay for three to six months at Swatch Art Peace Hotel working on a creative project. Sini-Pilvi Kiilunen (bottom left) created a powerfully romantic installation bursting with color and heartfelt emotion. Born in Finland in 1990, the young designer's winning artwork is a spectacular assemblage: intensely colored, handcrafted brocades form a backdrop to a table set with lacework, bejeweled notebooks, flowers, a photograph of a romantic young man, and an old-fashioned videotape player decorated with bright floral imagery. Rich in materials and juxtapositions, the artwork takes a deeper look at the man, uniting past and present in a time machine feeling. It depicts the man's loves and memories and tells the story of his life. His is a fascinating world, imbued with a touch the dandy and light-hearted chivalry.